There are several reasons – some more urgent than others – as to why women undergo breast implant removal. These include: having an aesthetic desire for a change of size and shape, implant leakage or rupture, and capsular contracture. Some of the other potential problems that may have developed after the initial augmentation, creating the need for saline or silicone gel implant removal include: shifting, wrinkling, sagging, asymmetry, bleeding, and/or infection. If you have breast implants and are considering removal, you have options and you do not have to live with implants that make you unhappy or uncomfortable. You may be concerned about how your breasts will look after the implants are removed. Dr. Samson is an experienced board certified plastic surgeon and will take extra steps to ensure a natural look and a safe removal. Dr. Samson offers breast implant removal, also known as an explant procedure, including “en bloc” removal of all implant material, and removal of breast capsules with muscle reattachment. Dr. Samson also performs breast implant revision procedures for women seeking a new look. There are varying reasons that women decide to get breast implants removed. Cosmesis: As trends change, some women are no longer pleased with the look of their breast implants and they seek removal for a return to their original look. Breast implants may need to be replaced over time, but some women opt for removal rather than revision or replacement. Rupture: Breast implant complications are rare, especially with the current advances in technology. However, implant rupture can occur, especially with older model implants. It is important that women have regular physical examinations to check for implant rupture. General Health Concerns: Extensive studies conducted in the past and currently taking place by the FDA and others, show that breast implants are safe. A growing number of women with breast implants believe that a disorder called breast implant illness may be causing them fatigue, joint pain, brain fog and other symptoms related to autoimmune disorders, and they are seeking breast implant removal surgery to help alleviate their symptoms. Although studies conducted by the FDA and others do not recognize breast implant illness, post breast implant approval studies should continue and possibly expand to explore the risk of genetic susceptibility to these symptoms. Dr. Samson is committed to women’s health and well being and performs en bloc breast implant explant surgery for women seeking to have their implants and the capsule surrounding those implants removed. If you do not choose to have new implants inserted upon the removal of the initial implants, or further cosmetic surgery, it is important to note that your breasts will never look the same as they did before breast augmentation (especially if large implants are removed). Your breasts may appear smaller than before the implants, which could possibly be attributed to hormone changes or weight loss. Sagging, tissue atrophy, and chest wall deformity may also result from complete breast implant removal without an exchange. Some imporvement in appearance will occur during the first six months after explant surgery. To get an idea of the results you can achieve with breast implant removal, view Dr. Samson’s Breast implant removal before and after photos. During the consultation with Dr Samson will discuss with you the steps and details of your breast procedure with you. The surgical plan will be individualized to your specific needs and desires. The breast implant removal procedure will typically take place at our surgery center, The Surgery Center of Volusia. If Samson determines that certain medical conditions necessitate that the procedure take place in a hospital, this will be discussed prior to scheduling your procedure. Patients will usually be placed under general anesthesia. For the breast implant removal surgery, anesthesia may be either local or general anesthesia. The incisions made during this procedure are typically created in the scar from the patient’s initial augmentation surgery. Dr. Samson generally uses an inframammary incision to access the breast implant; however, other incisions may be used. The entire explant procedure typically takes between 1 and 3 hours. When breasts are augmented with implants, the body responds within weeks of the breast implant surgery by surrounding the implant pocket with scar tissue. This scar tissue is called the capsule and ideally it is a soft sheet of scar tissue that helps hold the implants in place. Removal of the breast capsule is called a capsulectomy. Whenever possible, Dr. Samson will perform the breast implant removal as an “en bloc” capsulectomy which means that the entire capsule is removed intact with the implant inside, as opposed to incising the capsule to remove the implant separately. In some cases the capsule may have become malformed, repositioned or adhered to the chest wall in a way that makes it impossible or unsafe to perform an “en bloc” removal. In those cases, any remaining capsule tissue will be cauterized, but whenever it is safe to do so Dr. Samson will remove the entire capsule. One extra step that may be recommended for explant patients that have had their implants placed under the muscle is surgical reattachment of the pectoralis major muscles to the chest wall. After breast implants are removed, there is potential for animation deformity in which the detached muscle is visible through the skin. If so, Dr. Samson reattaches the muscle to minimize the risk of this deformity. Reattachment of the muscle may also improve blood flow for improved recovery and healthier breast tissue. It is normal to be concerned about how your body will look after implants are removed. There are a number of factors, including the size and condition of the implants, and how long they were in place, as well as the age and body type of the patient, that will determine the end result. Some patients inquire about breast lift surgery or fat grafting procedures in conjunction with the explant surgery. 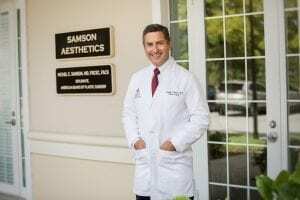 Dr. Samson believes that, in most cases, proper surgical technique during removal will result in a favorable aesthetic result without further surgical intervention. In cases with severe sagging or breast deformation after implant removal surgery, Dr. Samson may advise explant patients to wait approximately 6 months after their explant surgery to consider any additional procedures. The breast tissue will settle as it heals and blood flow improves and many patients are very happy with their appearance once they are fully healed. In some patients breast lift and/or fat grafting procedures may be appropriate at the time of explantation, and Dr. Samson will discuss this with you at the time of your consultation. In general, for the first few days after breast implant removal, there may be mild discomfort, swelling and bruising. There may be suction drains placed for a day or two. You should plan to devote the first week after surgery to complete rest and recovery. Patients may experience some discomfort, but pain medication will be prescribed. There will be restrictions on physical activity and strenuous exercise and manual labor should be avoided for 3-4 weeks. A post-operative appointment with Dr. Samson will be scheduled on the day after surgery, 5-7 days after surgery and at 5 weeks after surgery. The entire recovery period usually stretches over a few months. These appointments are important to assess your recovery; a follow up appointment 6 months after surgery will be scheduled. The cost of breast implant removal varies depending on the exact surgery planned, e.g. simple explantation, explantation with capsulectomy, “en bloc” removal, and mastopexy or fat grafting procedures will have varying costs. Also, anesthesia cost, cost of the surgical facility, and the cost of any medical tests and prescriptions you may need will vary. We have flat fee pricing for all breast implant removal procedures, including an all-inclusive “en bloc” removal with pathology for capsules, fungal/ bacterial cultures, Gram stain, and intraoperative implant photographs as well. Dr. Samson can give you an accurate cost estimate for your specific needs during a one-on-one consultation. We are available to answer any questions about breast implant removal. If you are living with breast implants that cause you physical discomfort or emotional distress, please contact us to take the first step toward feeling comfortable in your body. There are women with breast implants who self-identify and present with various systemic symptoms and believe that these are related to their breast implants. They refer to these symptoms as Breast Implant Illness (BII). Breast Implant Illness (BII) is a term used by women who have breast implants and who self-identify and describe a variety of symptoms including (but not limited to) fatigue, chest pain, hair loss, headaches, chills, photosensitivity, chronic pain, rash, body odor, anxiety, brain fog, sleep disturbance, depression, neurologic issues and hormonal issues that they feel are directly connected to their saline or silicone, textured or smooth breast implants. Silicone is an element that exists in nature as crystalline silica, which has been shown to activate the immune system in conditions such as systemic sclerosis which has been seen in stone masons. Silicone used in breast implants is different and to date has not been proven to cause any disease. This silicone does not exist is nature, it is created by hydroxylating silica to form polydimethylsiloxane. Medical grade silicone has had antioxidants, dyes, and plasticizers removed during processing. There is no diagnostic testing specifically for Breast Implant Illness (BII). This is one of the current areas of focus for the Aesthetic Surgery Education and Research Foundation, the research arm of the American Society for Aesthetic Plastic Surgery. There are tests for autoimmune diseases that can be performed to evaluate for potential causes of a patient’s symptoms. There are patients who have symptoms they attribute to Breast Implant Illness (BII) with positive immune testing and others with all laboratory tests which show no abnormalities. In 1999, The Institute of Medicine Committee on the Safety of Silicone conducted an extensive review of the available literature and concluded there was no demonstrated clear link between silicone implants and any systemic illness. There have been studies of many different sizes and design to look at the safety of breast implants themselves. These have looked at specific autoimmune disorders and diseases. In aggregate, these studies show little to no links between breast implants and any disease. Studies of patients who have symptoms that they have related to their breast implants have not shown consistent laboratory abnormalities to define a distinct syndrome. To-date, there has been very little in the way of research into this entity that has been labelled Breast Implant Illness (BII) by women with breast implants. Q: What are plastic surgery societies such as ASAPS and ASERF doing to better understand this group of systemic symptoms being called Breast Implant Illness (BII)? Because there are many women that self-identify as having Breast Implant Illness (BII), we are listening. ASAPS and ASERF are developing a new scientific study to examine this entity. They are also providing plastic surgeon members with a questionnaire to use to collect a record of complaints from patients with implants, as well as one to utilize for post-explantation. We cannot yet define BII and therefore cannot say with any certainty that it exists, because we do not have any tests we can run to prove or disprove its existence. However, we can listen to and partner with our patients to determine what is the best course of action to address their complaints, be it explantation or otherwise. Q: What will we do when a patient complains of Breast Implant Illness (BII) symptoms? We will not ignore our patient’s concerns. Their symptoms are real and whether or not they can or cannot be attributed to their implants isn’t relevant since there is simply no existing way to prove nor disprove causation or association. Patients who present with concerns of Breast Implant Illness (BII) have real symptoms that often cannot be categorized into any specific known disease entity. This does not mean their symptoms are not real and they deserve a full evaluation. The various options need to be discussed and hopefully, with further research, we may be able to determine which patients may see symptom improvement or resolution with removal of their implants and which may not see any change. As there is no definitive link between the often subjective and divergent list of symptoms, and no means for testing, there is no ‘known’ risk. Many of the symptoms described by breast implant patients are experienced by the general public on a regular basis with or without implants. That isn’t to write-off a potential connection, but no connection has been established to-date. Q: What do we offer when a patient asks for an en bloc (total removal of capsule and implant)? There are many medical inaccuracies perpetuated by the internet. Some patients believe that a total capsulectomy is necessary to remove all causative agents and they prefer it be en bloc, often times without having a full understanding of what size incision is necessary for en bloc. We like to discuss the reasons why we would perform a total capsulectomy with any patient. Not all plastic surgeons routinely perform a capsulectomy with explant, but some do. It is important to explain that it is not always possible to remove all of the capsule. Sometimes a portion of the capsule must be left behind or is disintegrated with the use of electrocautery to prevent significant damage to muscle, rib or lung. A larger incision is needed for an en bloc capsulectomy. If axillary approach or periareolar approach was used for breast implant placement, it must be noted that patients cannot have the procedure done through those incisions. There are increased surgical risks associated with en bloc capsulectomy which requires a complete dissection of all the tissues surrounding the breast implant. We do not have enough collective data to guarantee any improvement in symptoms labelled Breast Implant Illness (BII). BIA-ALCL is currently classified as a lymphoma. Many experts believe that it behaves clinically as a lymphoproliferative disorder (LPD) that encompasses the spectrum of disease from benign CD30+ seromas, to CD30+ malignant seromas, to invasive capsular disease, and finally metastatic disease. Current research is underway to further understand the proper classification of this disorder. Similar to other lymphomas, BIA-ALCL is a highly treatable disease with high cure rates. The FDA reports that it is 1:3,817 to 1:30,000 in their latest statement. These risk assessments are changing on an ongoing basis, but this is the most accurate information currently available (February 2019). Grade 1 (Smooth only) – In global databases, there has not been a confirmed case of smooth only. In the Feb 2019 FDA statement, it was reported that “there have been reports of BIA-ALCL in patients with smooth-surfaced implants and many reports do not include the surface texture of the implant at the time of diagnosis.” At the time of this publication it is known that a single case of smooth only BIA-ALCL was originally reported to the FDA; however, it was later determined that this was not accurate, and the case was a mixed implant case, and the report to the FDA was amended. So, in conclusion as of February 2019 no cases of smooth have ever been definitively described. Q: If a breast implant patient comes to see us when she develops a first symptom, will she be cured? Q: Differences in implant texture and what role that factor plays in the research? Of the 457 unique cases of BIA-ALCL (FDA 2-2019) implants are both silicone and saline. It appears to purely be related to the surface of the implant and not to what the implant is filled with. The plastic surgery societies ASAPS and ASERF emphasize that the most important issue for women with breast implants is to screen for breast cancer with self-exam, a regular physician exam, and mammography/ultrasound/MRI as recommended by their physician. Regardless of BIA-ALCL, all women should see their plastic surgeon immediately if they note a change to the size, feel, or shape of their breasts. Patients considering textured breast implants should discuss this issue with their plastic surgeon. As of this publication, there are no true contraindications of having textured implants. There are patients who are candidates for shaped textured implants. In them, science must precede fear. Q: Do we recommend textured implants to a patient? The choice of implant type is ultimately a decision between an educated patient and her board certified plastic surgeon. There may be certain circumstances where a textured implant is recommended for particular patients. CD30 immunohistochemistry is not diagnostic for BIA-ALCL; however, it is a marker for activated T-Cells. If a patient’s seroma is CD30 positive, and the cytology is negative, this likely represents a precursor to BIA-ALCL, and should be treated with total capsulectomy. If the seroma test is CD30 negative with negative cytology, then it should be treated as a benign seroma using the idividual surgeon’s protocol. Current recommendations for the treatment of BIA-ALCL call for bilateral capsulectomy (removing all the scar tissue) and removal of the old breast implants. This is a very common procedure performed by plastic surgeons, identical to what is done when an implant has ruptured, or capsular contracture has developed. Smooth implants can be put back in or the patient can choose not to have implants. In all early stage cases, the disease has been fully resolved by this surgery alone. The majority of patients require no additional treatment. However, if the disease has spread to lymph nodes or grown into the adjacent tissues, chemotherapy and radiation may be necessary. These are very serious treatments with significant side effects. The rates of BIA-ALCL seem different throughout the world. This may be due to different reporting and registries, but there may be a genetic predisposition that is not yet fully understood. For instance, as of this time there are very few cases in Asian patients. The risk is only with textured implants and not smooth implants; the rate is no different between silicone and saline; it occurs in both cosmetic and reconstructive patients. There is no test to determine whether one textured implant patient is at any more risk of developing this disorder than any other patients. For textured implant patients, neither the FDA nor any plastic surgery society currently recommends that women should preventatively remove textured breast implants to prevent BIA-ALCL. However, there are women who have been concerned enough about BIA-ALCL and have chosen to have their implants removed. There are some women who were already considering a breast implant revision, and the BIA-ALCL issue gave them one more reason to decide to proceed. Breast implant patients should have ongoing follow up. Current FDA recommendations and ASAPS recommendations indicate that patients with textured implants with no issues should not do anything and implant removal is not recommended. Major plastic surgery societies and research wings such as ASAPS, ASERF, and the FDA, along with the implant manufacturers are intensely studying BIA-ALCL. To date, no specific causal factors have been identified. Implant texturing, bacteriologic contamination, and genetic factors have been implicated and are undergoing further study. Q: Do we recommend against the use of textured implants?